YAKIMA, Wash. – The Yakima Police Department’s first narcotics K-9 has been given a very prestigious honor. K-9 Flash has taken the title of Law Enforcement Dog of the Year for the American Humane Hero Dog Awards. The K-9 is being honored for her service with the department assisting the DEA narcotics task force teams, regional swat team and patrol division. She has been involved in 3,000 deployments with 2,200 narcotic finds and seizures during her career. Johnson founded Project K-9 Hero in 2016 and says Flash was the inspiration. He said the national non-profit organization helps take care of retired military and police dogs across the country. “Her service is far beyond what she’s done for the city of Yakima,” Johnson said. The pair have toured around schools across the country to read Flash’s children’s book, K-9 Flash Becomes a Hero. 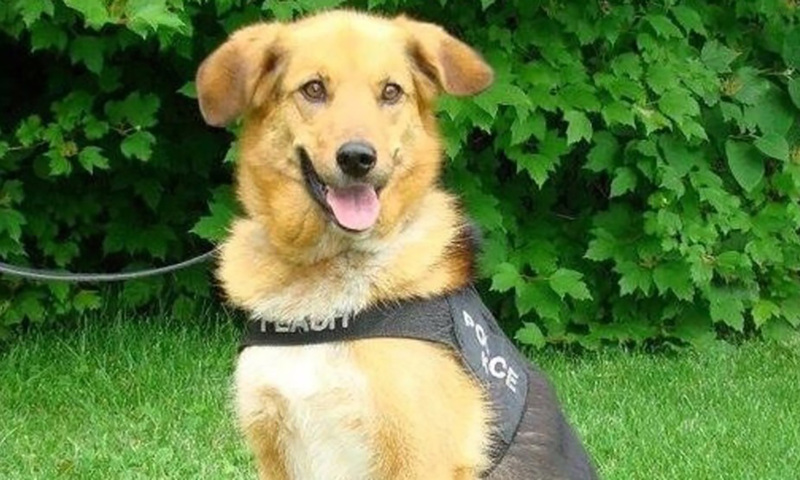 Johnson said the former police K-9 rose to success after she was found as a stray on the streets of Everett. She is now around 14 years old, has Lyme’s disease, is losing mobility in her back legs and this may be her last year. Flash now heads to Hollywood where she will attend a gala broadcast nationwide on Hallmark Channel USA this fall, organizers say. To vote for Flash as the overall American Humane Hero Dog of the Year, click here. Voting is open until September 5.